I finally got around to watching The Conjuring 2 tonight, I thought the first film wasn't bad, it certainly showed promise and had some decent acting. 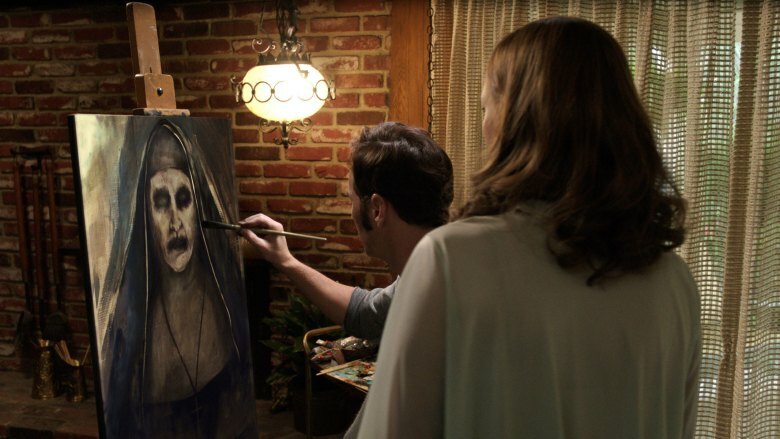 The less said about the mediocre spin off film Annabelle the better. This sequel is again directed by James Wan (Insidious, Saw) and there is a real fear he is running out of ideas. 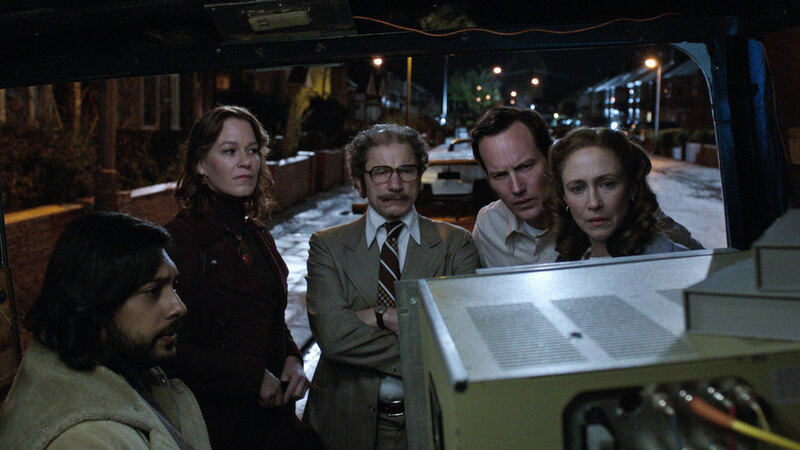 Patrick Wilson and Vera Farmiga reprise their roles as paranormal investigators Ed and Lorraine Warren who this time have headed to England to help out a family being haunted by the spirit of a mischievous old man calling itself Bill Wilkins. It is the youngest daughter of the family; Janet that the supernatural activities are happening around. Lorraine after frequent visits by a demonic looking nun promising the death of Ed is wanting to leave the paranormal world behind, but asked to investigate as a favour to the church she feels duty bound. The Warrens job is just to obtain proof that anything unnatural is occurring or not but soon they find themselves caught up in events. Initially I was not too impressed with The Conjuring 2, like the found footage genre (such as the Paranormal Activity series) the haunted house genre is getting stale, this has been seen with the dullness of the later Insidious films and so I felt a bit anxious if this movie would be a waste of my time. Things are as predictable as ever to begin with, a slow build up of spooky goings on such as objects moving of their own accord, jump scare ghosts popping into view, and evil voices. However rather wonderfully this film just gets more and more effective as it goes on, it is no Sinister in fear stakes but by the end I did get the legendary tears of fear in my eyes. There is a lot of misdirection in just what the root cause in the house is, even giving some evidence that it is all just being caused by Janet (Madison Wolfe), but the variety on offer of the old man spirit and the demonic looking nun keeps you guessing a bit. The best moments come because of the special effects and in spite of the special effects. By far the most memorable moments of horror comes with the nun who looks very creepy. There is one fantastic sequence when she climbs out the wall behind a painting that Ed had done of her and rushes Lorraine. The house the hauntings occur at has all sorts of destruction done to it which all feels quite violent and effective at creating chaos. Not so good though unfortunately is a recurring demon creature that takes the form of sinister children's tale the Crooked Man. This huge lanky figure wielding an umbrella is a great idea, and he was actually played by a real person, but there does seem he has some dodgy CGI overlaid on him, he seems more like a fantasy character and so felt out of place, which is shame as his stop motion way of moving was impressive. A complaint of the first film from me was that as it was based on actual events then the fates of all involved was already known, this was not an issue this time around. I have heard that in reality the Warrens involvement in this case was minimal but the realness made for some super unsettling moments at the films end where the actual transcript of the supposed voice of Bill Wilkins was played, as well as photos taken at the time such as Janet levitating are shown. It makes this seem more scary than if it had just been made up for film (the actual case seems far less interesting than the Poltergeist levels of madness shown here). The acting is really quite good throughout, Wilson and Farmiga are the stand out characters, their relationship just feels so real and full of love, a sub plot involving Lorraine having a vision of Ed's death put so much flesh on them. The children surprisingly all are pretty decent, one of the boy's stutter seemed a bit awful but in general they were not irritating at all even if some of them got barely any screen time. I though Simon McBurney as Maurice Grosse was the best supporting actor, loved his performance. The film takes place in the 1970's and so much effort has gone to recreate England at that time, even featuring a few comedy moments for the audience such as a scene involving a video camera. The Conjuring 2 proves that despite a lot of similarities to other films of the genre there is still some life left in it for a well made horror. This is a film that gets better and better as it goes on, it is not the scariest film out there by far, but it has a decent enough amount of good ideas, subtle references to both The Conjuring and Annabelle, and some effective acting. I will end with the news that there is a spin off movie planned from this film too, it is going to revolve around the demonic nun creature, I hope to god it is better than the first movies spin off.